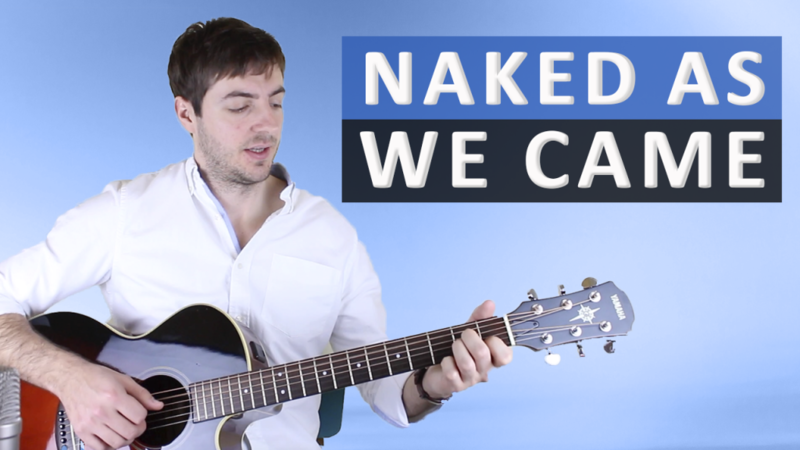 Scroll down for full video lesson (with tab) of Naked as We came. Naked as We came was written by American singer-songerwriter Samuel Beam, more commonly known as Iron & Wine. The song is taken from his studio album 'Our Endless Numbered Days' which was released in 2004. This song isn't too difficult to play and thankfully is only made up of two parts - a verse and a chorus. This is a great one to learn if you're still reasonably new to fingerpicking, as there are no difficult barre chords to deal with and the right hand fingerpicking pattern is the same throughout the whole song. Naked as We Came is no. 15 on my Top 60 Fingerpicking Songs of ALL TIME list. If you've not seen the list be sure to check it out and subscribe to get weekly lessons for each song! Before you start to learn this song make sure that you've down tuned your low E string to D and that you have put the capo on the second fret. If you don't do this it will sound nothing like it and probably get you a bit wound up! The intro is exactly the same as the verse. First off take an open shape C chord and then push it up two frets, now your first finger should be on the 3rd fret of the B string, 2nd finger should be on the 4th fret of the D string and 3rd finger should be on the 5th of the A string; the High E and G strings should ring open. Make sure that you're not accidentally muting them with either your 1st or 2nd fingers. Now you have the correct chord held down with the left hand you are ready to start fingerpicking with your right. The picking pattern is consistent throughout the whole song and constantly plays Thumb, 1st, Thumb, 2nd or P I P M. Before you start doing anything else make sure that you get this pattern rock solid. Once your right hand is ok with the fingerpicking pattern you can start moving the bass notes around. First off you play the root note on the A string, then an open E string, then back to the A (open this time) and finally back to the E string again. For the second bar of the verse you let the D, G and B strings ring wide open and just move the bass note around. First you play the 2nd on the E string followed by the 4th, then 2nd on the A string followed by an open A. The pattern in the right hand has not changed at all. The only difference in chorus from the verse of Naked as We Came is the first half of it, this time we go to an Asus2 chord and fingerpick our way through that. The thing to watch out for here is that you bring in your third finger on your right hand and pluck the high E string with it, you don't have to do this but I recommend it. Other than that it shouldn't be any harder than the verse. Thanks a lot John, really glad you like them. 2 down, only 58 more to go! You’re a very good teacher. I am so new to guitar (started mid september) and your methodical approach has helped a lot. Can’t wait to learn more! Def gonna slowly work through the list. The Pink Floyd song is next!! Thank you very much, sounds like you’re doing well considering you started in September. Good effort! The songs really do start to get pretty tricky and what’s great is that there’s always something new to learn in each one. Really loving this site, I wanted to put in a request…… I’m a big Leonard Cohen fan and would like to learn The Stranger Song. Is this something you may consider? Thanks for the requests, I’ll definitely consider it!